I know that I tend to focus on having bipolar here, so I thought I’d mention something else for once! Well that, and I feel physically like I’ve been run over, so trying to think up something interesting and specific to my mental health would be like running a marathon, ha ha. Having said that, what I’m bringing up today is as relevant to my mental health as anything else. It is my number one non-gaming, non-reading hobby – doing things with yarn! My mother started me on this addiction when I was 5. She gave me a crochet hook, a ball of yarn, and taught me how to do chains. I’d chain an entire ball, unwind it, roll it back up, and repeat as I felt necessary. I enjoyed it, and even learned how to make chains by hand from my father. However, Mom sort of forgot to teach me anything else. It wasn’t until I was in my early 20s and realized that she’d taught my younger sisters more than chains that I got on her case to mentor me! She made me demonstrate that I could do an even chain, then started me off on single crochet. I made my first scarf that same evening while babysitting friends engaging in hallucinogens at a pretty lake. 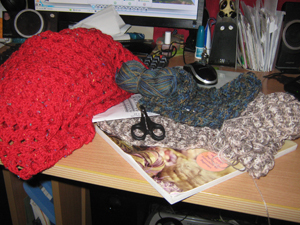 I was hooked (har har), and had her show me double crochet; I made my first attempt at a hat that night. However, I have a slight curse — I’m left-handed. I actually am all about being left-handed in every way possible, and have been fortunate to grow up in communities where the handedness split was more 30/70 than 10/90 (art school, language school, and then my job as a military linguist), but crafting wasn’t back in vogue at that stage. I did a lot of square and granny square things, and freeballed pretty much everything because between my hand and the undiagnosed bipolar, I couldn’t actually process trying to follow a pattern without my brain shutting down on me. It’s only been this past year of being medicated and regularly attending a crafting group where I have found enough confidence to follow some patterns, and will shortly have my first garment to prove it! 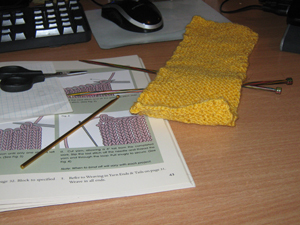 Alongside that, I wanted to learn to knit. It made sense to me to try and pick up both of the main woolcrafts, but there was that brain shutting down thing going on. My sister managed to sort of show me once over a weekend visit, but it didn’t stick. I bought books, I watched videos, but my brain was too freaked out to follow any of it. It took nine years, but this past week has finally hit this point where it sort of makes sense. I can cast on. I can knit. I can purl. And I can even cast off/bind off/make the stupid thing be finished. I’m not sure anyone without a mental health issue will understand just how challenging it is to try and do anything in the face of the anxiety/freaking out/DROWNING OUT OF ALL REASONABLE THOUGHT that comes with bipolar and other disorders, but I’m sure some of you guys can appreciate the muppet flailing hell that it can be. Of course, being a hobby, it serves the purpose of providing something akin to relaxing. Which, for me, is tense shoulders and intenser concentration… I know, I fail at floppy. I’m working on it. But it does bring me the enjoyment of doing, of doing something that generally works well to exclude negative and intrusive thoughts, that (if done right) ends up with some sort of useful object. Anyways, I might bring up the crafting a bit more here and again — we’ll see. I’d love to hear what you guys do for fun, and if helps shoosh up the brain demons!